By Keith Cowing on April 10, 2012 5:38 PM. "Experiments using malt from the Ardbeg distillery on Islay are being carried out on the International Space Station to see how it matures without gravity. Compounds of unmatured malt were sent to the station in an unmanned cargo spacecraft in October last year, along with particles of charred oak. Scientists want to understand how they interact at close to zero gravity. NanoRacks LLC, the US company behind the research, has said understanding the influence of gravity could help a number of industries, including the whisky industry, to develop new products in the future." "The Ardbeg Distillery has been distilling and maturing Scotch Whisky for over 300 years, and you don't last that long without innovating. 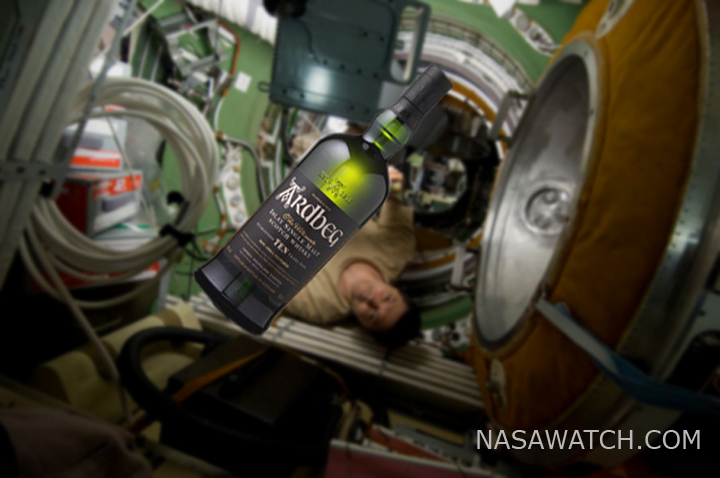 It's no doubt that drive that has led Ardbeg to pursue its latest experiment - to see whether Scotch can properly mature while it's in space, on board the International Space Station." Keith's note: Obvious jokes not withstanding [Larger view], this is an interesting commercial use of the ISS - if somewhat unconventional - one that has attracted actual private investment at a time when NASA's scorecard is rather lacking in this regard. Imagine this: an actual biotech process that is being investigated in the unqiue environment of space. Fermentation and distillation are industrial processes with many other applications than just making spirits. Outcome? Who knows. Only the experimenters have commented. Does NASA or CASIS make note of this? Of course not. Will they mention it in the future? Doubtful. Why bother? No one has ever asked the ISS National Lab or CASIS folks to be responsive or innovative. Why start now? This page contains a single entry by Keith Cowing published on April 10, 2012 5:38 PM. Trouble Ahead for NEEMO? was the previous entry in this blog. Slow Motion Raid On NASA's Commercial Space Budget is the next entry in this blog.